Wednesday, Aug 8, 1888 More than cool, & quite windy. As well with our folks, & all up in good season, Having Mr Wedgwood's horse & carriage Ellery carried Ch- & little girls to Decorah this A.M. where they took train for Hawkeye at 3:34 o.c. P.M. when he returned calling at Mrs Stones for me first of eve, & where I had enjoyed most of day, being in at Mate Smith's with Mary, P.M. & also in at Beemans store. Think had half unconsciousness soon after reaching there A.M. Thursday 9 Quite cool still, less windy, pleasant. Ellery on hand in good season, & we had very quiet breakfast of course. 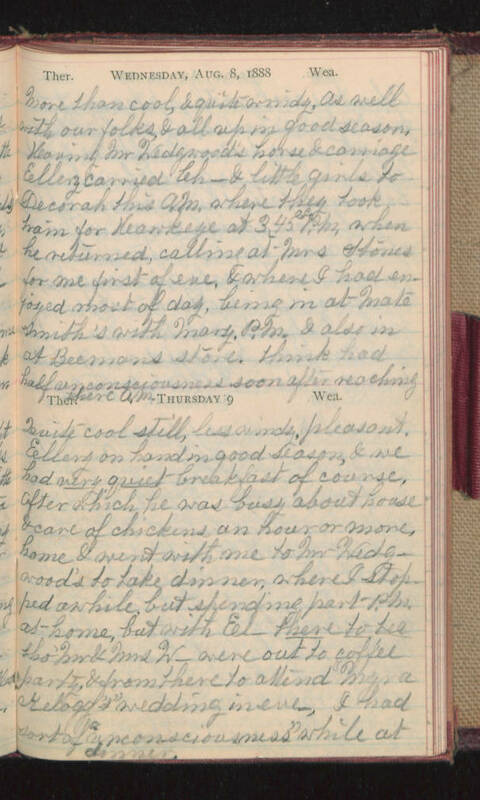 After which he was busy about house & care of chickens an hour or more, home & went with me to Mr Wedgwood's to take dinner, where I stopped awhile, but spending part P.M. at home, but with El- there to tea tho' Mr & Mrs W- were out to coffee party, & from there to attend "Myra Kelogg's" wedding in eve, I had sort of "unconsciousness" while at dinner.